In the last two months, the VA has made two significant announcements about its efforts to end veteran homelessness. The VA’s goal is to end homelessness among veterans by the end of the year. On March 31, 2015, the VA announced that it was awarding almost $93 million in grants under the Supportive Services for Veteran Families (SSVF) program. These 3-year grants will help approximately 45,000 homeless or at-risk veterans and their families. The grants will be awarded to private non-profit organizations and other agencies that will then provide support services to very low-income veterans and their families who are trying to transition to or remain in permanent housing. These organizations also provide eligible veterans and their families with assistance in case management, help in obtaining VA benefits, access to health care services, transportation, housing counseling, child care, legal services, and more. On April 20, 2015, the VA and the US Department of Housing and Urban Development (HUD) announced nearly $65 million in rental assistance funds to be provided through the HUD-VA Supportive Housing (HUD-VASH) Program. HUD-VASH combines rental assistance from HUD with case management and clinical services provided by the VA. Under this program, VA medical centers assess veterans who are homeless and then refer them to local housing agencies where they may obtain vouchers for rental assistance. Eligibility is based on several factors, the most important of which is the length of time a veteran has been homeless. Sadly, we know that a large percentage of homeless veterans are also disabled veterans. A count conducted on a single night in January 2014 showed that 49,933 veterans were homeless that night. That number represents a 33% drop since 2010. 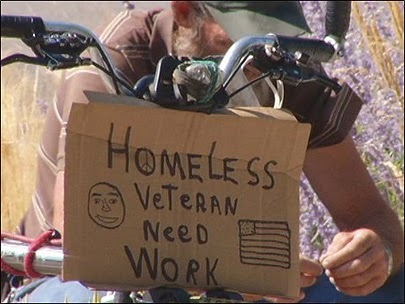 Figures from fiscal year 2012 show that 51% of homeless veterans were disabled, compared to 26.9% of all veterans. If you or someone you know is homeless or in danger of becoming homeless, there are now several ways to get help. You may contact the Homeless Coordinator at your local VA facility or call 1-877-4AID-VET (1-877-424-3838). In addition, you can go to www.va.gov/homeless or www.va.gov/homeless/ssvf.asp for more information and assistance. We applaud the VA for their goal of ending veteran homelessness by the end of 2015. Achieving this ambitious goal will take a determined effort on the part of all involved. Veterans, if you need help, we urge you to be proactive and let people know. Help is out there—just ask.